Owning a recommended set of dog clippers gives you the opportunity to trim your dogs hair to a comfortable level. Their coats can become very thick and heavy, which during the hot weather can cause your dog to overheat. The best dog hair clippers are the UltraEdge AGC Super 2-Speed which are developed by the premium Andis brand and are perfect for all dog coats and breeds. There are various dog hair clippers for grooming that are corded or cordless with various interchangeable blades for the perfect length. If this will be your first set of dog clippers, stick to the single speed clippers and upgrade later to variable speeds. There are many factors to consider when looking for the top dog hair clippers but many people believe that the higher the power, the better it is. This is simply not true because for short haired dogs with thinner coats, the speed is simply not required. Alongside the dog clippers, you will want a good set of blades for the perfect length. There are several types of blades from interchangeable to clipper specific blades. The most expensive blades you can buy are the ceramic type with the main benefits being they do not transfer heat from the clippers to the dogs skin. Considering all the factors, below is a list of the best dog hair clippers for grooming that are designed for all dog breeds and coats. Andis are a premium dog hair clipper brand that offer superior features and quality compared with the competitors. It is suitable for use on all dog coats and all breeds with a speeding rating at 3400 to 4400 strokes per minute. The UltraEdGE AGC is designed to allow the user to switch blades easily and allow for cleaning. Once powered up, the Andis runs quietly where you have the option to increase the speed of the rotary motor if required. It is one of the best dog hair clippers for matted hair with specific Andis blades for the job. Andis recommend that you use their number 10 blade so that matted fur can be trimmed very easily regardless of the coat. It is a heavy duty clipper that provides a consistent form of cutting backed by a powerful motor with 2 speeds. In terms of the blades, they are all designed to be long lasting that will always stay sharp for an easy trim. The blades themselves can get hot after prolonged use but with the simplicity and ease of switching between blades, it really is not a problem. The UltraEdge AGC is the latest model by Andis and comes with 6 different colors. Overall it is the best dog hair clippers for grooming and although its expensive, it offers excellent quality and is the Mercedes Benz of the dog clipper world. The Wahl dog hair clipper uses a lithium ion battery to provide up to 90 minutes of run time and a quick recharge of 60 minutes to full. In terms of speed, you can achieve 5,500 strokes per minute, which is very fast for a cordless dog hair clipper. It is the most expensive professional clipper in this article but it is the best cordless dog hair clipper money can buy. It is so good that Wahl offer 30 days satisfaction guarantee and 1 years warranty as peace of mind. It provides a constant single speed for a professional finish. Wahl take great pride in the fact their dog hair clipper has no vibrations, very quiet and maintenance free. There are 5 different blades to use from fine, coarse, pro, diamond and a non-adjustable blade. All blades are made from high quality steel and are adjustable for the perfect cut length. Overall, the Wahl professional dog hair clipper is lightweight yet provides plenty of power. It is the best cordless dog clipper that provides virtually no vibrations and doesn’t get too hot under prolonged usage. The Oster A5 is one of the most popular dog grooming hair clippers on the market with an ultra quiet motor which is great for nervous dogs. In terms of the power that is output, you can expect 4,000 strokes per minute, which is able for any dog coat. There is one simple switch that enables you to perform precision hair trimming near the face and ears at low speed and then full body trimming with the fast speed. Oster ensures that you are in complete control and is great for both beginners and professionals. The blades used by Oster dog hair clippers are known for being extremely high quality and sharp. They are machined and cryogenically treated to increase the hardness and ensure they are long lasting. The USA made Oster is a cheaper alternative to the ones mentioned above with matching quality that has been trusted by dog groomers for many years. The Bonve Pet grooming set complete with clippers, combs and blades is perfect for the average dog owner looking for cheap dog hair clippers. It is a cordless clipper that comes with its own power adapter and charging station. Just because they are a budget dog hair clipper grooming set, don’t think they are no use and do not feature anything special. For example, the blades are ceramic with high temperature resistance and built for optimum hardness. Everything you need in a dog grooming kit is included with 4 different sized combs. Overall, they are the best cheap dog hair clipper sets for the money and you will not find as good of value for money as the Bonve Pet set. If you are looking for a bit more than the Bonve Pet kit, the Punada is the premium version dedicated for thick dog coats. For the additional control of the clipper, it uses a 5 speed dog hair clipper with built in LED screen to view information. The kit comes with a comb, 2 different teeth scissors and four size guards for the clipper. There is 5 different speed that the clipper can achieve and they range from 5000/5500/6000/6500/7000, which is excellent for such a cheap dog hair clipper. The large capacity battery will last 4 hours on low power and takes 3 hours to fully charge up, which is great for those doing one large trim. This is much better than the other grooming kit by Bonve. if you are looking for a complete grooming kit and have that little extra to spend, the Punada is the best buy for the money. In the long run, buying your very own dog hair clippers will work out cheaper than visiting a professional groomer in your area. Prices can reach triple figures for just one grooming session, which is more than the clippers themselves. Below are some factors that you should consider before you purchase your next dog hair clippers. For matted dog coats, its important that there is enough power for the clippers to trim through the hair smoothly. Many are measured through Strokes Per Minutue and for cutting through matted hair, you should look for at least 3,000 SPM. Many dog owners will think that the power they see on the cheaper dog hair clippers mean they are the better buy. For example, the Bonve groomer kit goes up to 7,000 SPM, which is the highest in this article. However, with all this power comes with noise, heat and vibrations. The best dog hair clippers are usually between 3,000 and 5,000 SPM and remain quiet. This is great for dogs that are scared or nervous of machines coming towards them. The majority of the time, you do not even need all the power and in sensitivities areas, you will want to be at the lowest setting. When bulk trimming, this is where you switch the power up. Corded clippers will also have power and there is no need to remember to charge it up. Simply use it and put it away but of course, the wire may become annoying over time when trimming your dogs hair. Cordless dog clippers are easier to use and excellent for those awkward spots, which there are many on a dog. However, if you have a large dog with lots of matted hair, it may be better to go with the corded. This is because many clippers will not have a huge battery life and not as powerful the corded equivalent. You need to ensure that after use, the dog clipper is cleaned properly. However, this is not just the only thing, you also need to service it with oil, just like you would a car. Overtime, the blades within the clipper can become dull. Avoiding oiling up your dog hair clipper could even cause your dogs trim to go wrong. The dull blade will cause adverse effects on the cutting, making the trim uneven. It is not unheard of for dogs to be terrified of the clipper so its important that you allow the dog to get used to it. Leave the clipper (turned off) near them for a while and even touch their hair with it to show them that there is nothing to be afraid of. As for yourself, ensure that you know every function of the dog clipper. For example, learn how to switch between speeds (if its variable speed) and that you know how to turn it off quickly if your dog is moving around too fast. Before you begin trimming, ensure that your dog has no knots or tangles and they are completely dry. Failing to spot such defects in your dog coat can cause an uneven/horrific trim for your dog. When using your brand new dog hair clippers on your dog, regulate the temperature of the blade because these do heat up quickly. Be sure to have other blades available and coolant to cool the blades down before touching your dog. Never use water to cool down the blades because this will wet the dog and cause the clipper to pull. Once you are finished, you will have a lot of dog fur. If you have done this inside, ensure you have a vacuum dedicated to dog hairs otherwise you may spend longer cleaning with a standard vacuum. Finding the best dog hair clipper for grooming will certainly help the ease of trimming your dogs hair. 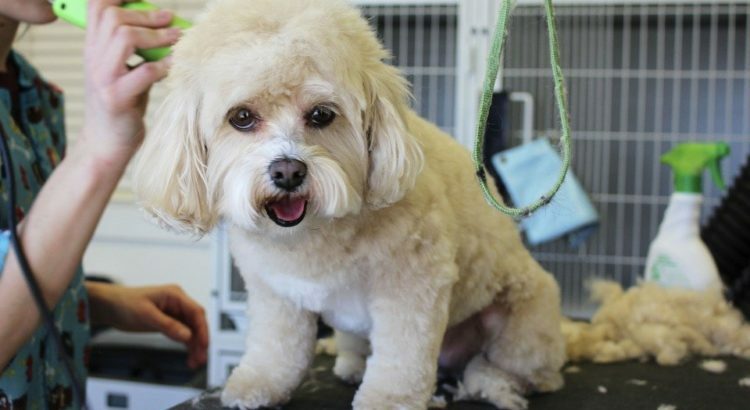 Cutting their hair in the hot weather is when your dog will require it most as the shorter the hair, the cooler they will be. Just because the cheaper grooming kits that include other bits and bobs such as combs, cleaners and more look great value, they may not be the best. The first 3 within this article are premium and offer features your dog will appreciate.